Presented here is a collection of four game used items, including two jerseys and two jackets, from members of the New York Mets 1986 World Series winning season. 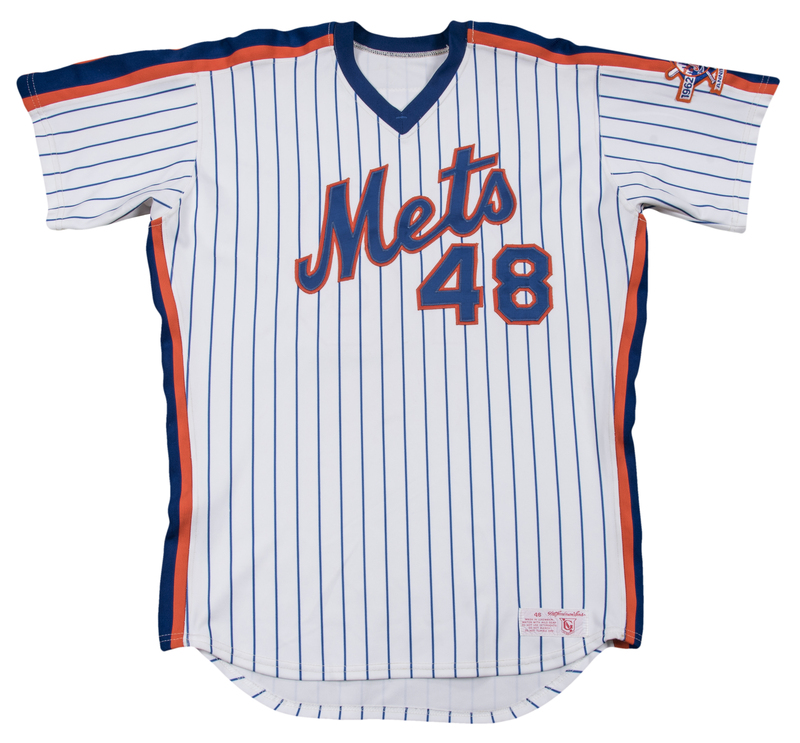 The first item is a pinstriped home pullover jersey worn by pitcher Randy Myers in 1986. 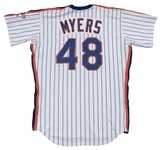 This jersey has “Mets” and Myers’ number “48” sewn on the chest in blue and orange tackle twill, and “MYERS” and a second “48” sewn on the back of the jersey in the same fashion. 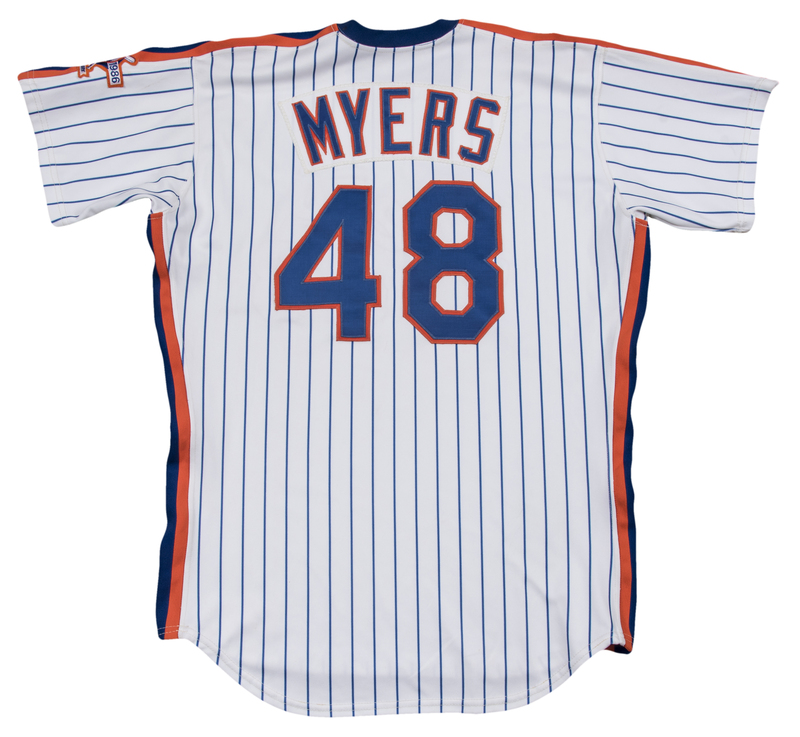 “MYERS” is sewn over a matching white nameplate. 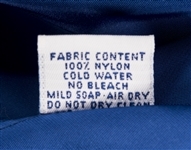 A Goodman size “46” tag is sewn on the front left tail. 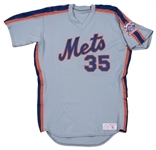 The second jersey in this lot is a gray road pullover worn by catcher John Gibbons in 1986. 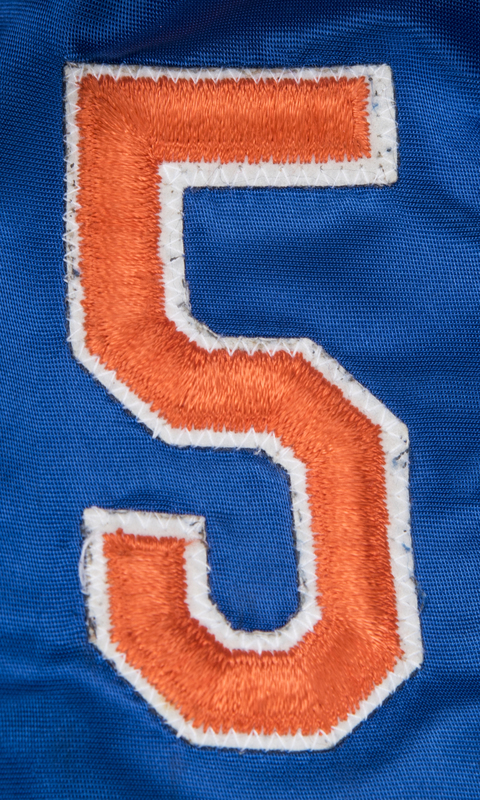 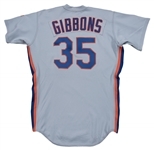 “Mets” and Gibbons’ number “35” are sewn on the chest in blue and orange tackle twill. 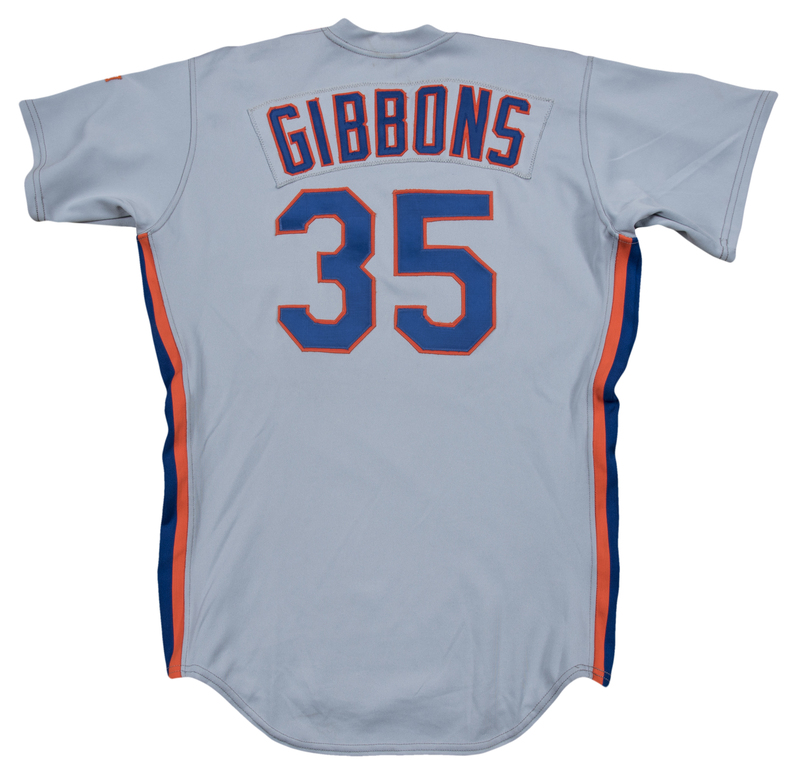 “GIBBONS” is sewn across the back shoulders over a matching gray nameplate in blue and orange tackle twill, while his number “35” is sewn lower down the back in the same fashion. 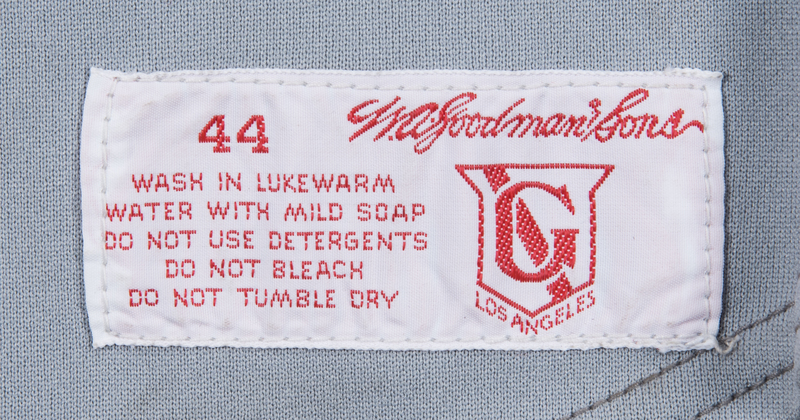 A Goodman size “44” tag is sewn on the front left tail. 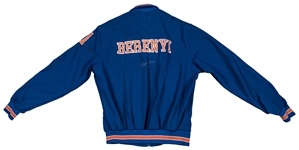 The next item is a blue Starter jacket worn by Bruce Berenyi. 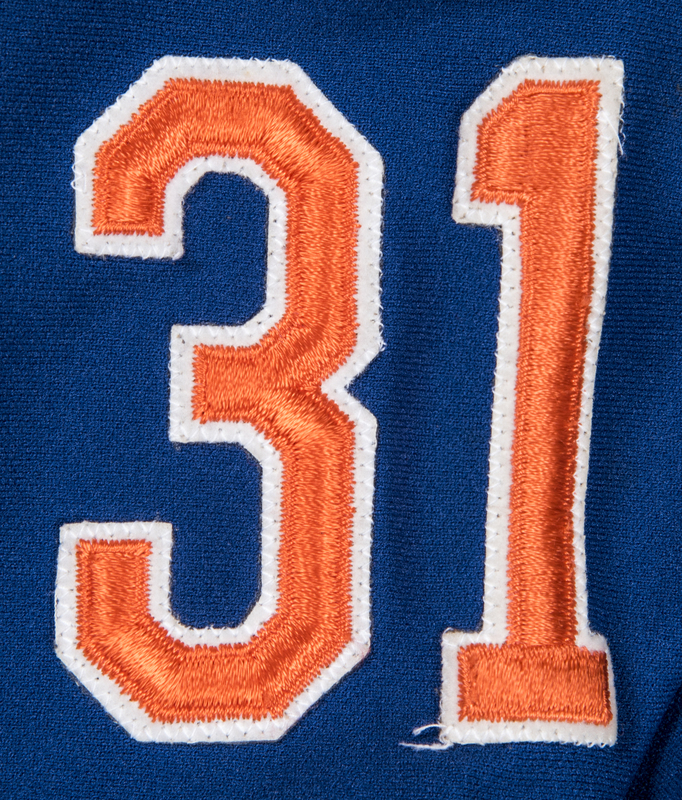 “BERENYI” is sewn across the back in orange and white, while his number “31” is sewn on the left sleeve in the same fashion. Berenyi has signed the back of this size “XL” jacket in silver marker. 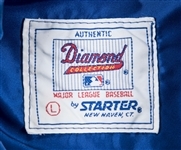 This jacket comes with a COA from Beckett Authentication Services (F63978). 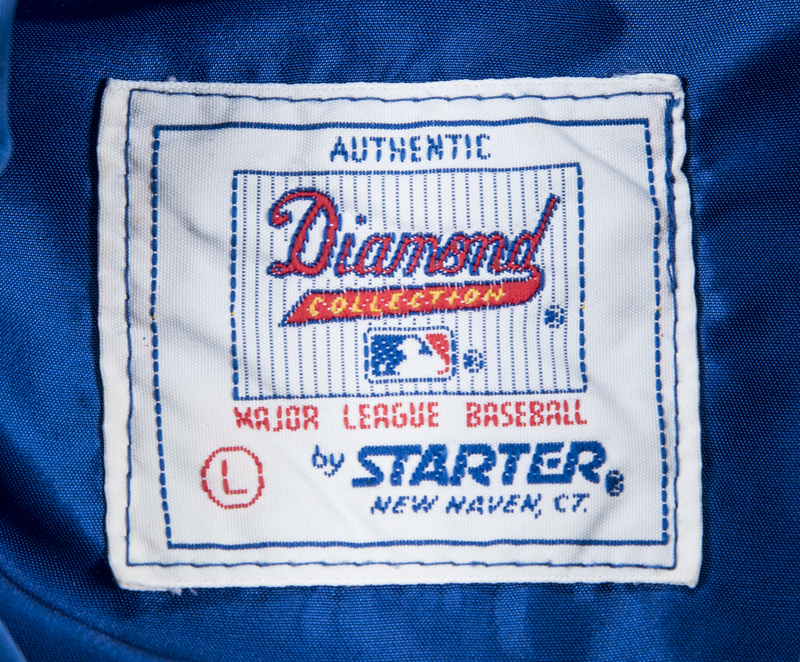 The final item in this lot is a satin blue Starter jacket worn by Davey Johnson. 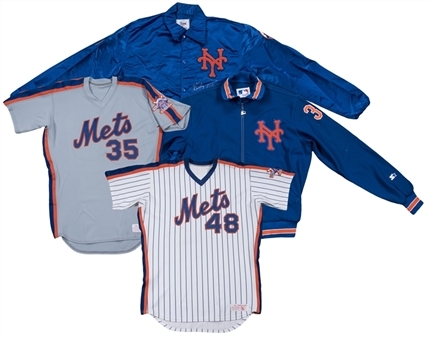 This jacket has a Mets logo sewn on the left chest, a Mets skyline logo sewn on the left sleeve, and “JOHNSON” sewn across the back. 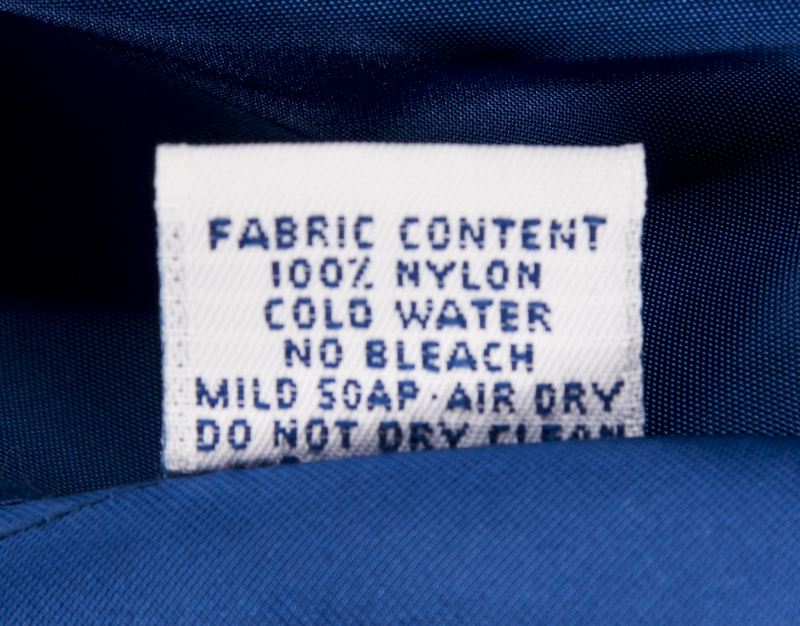 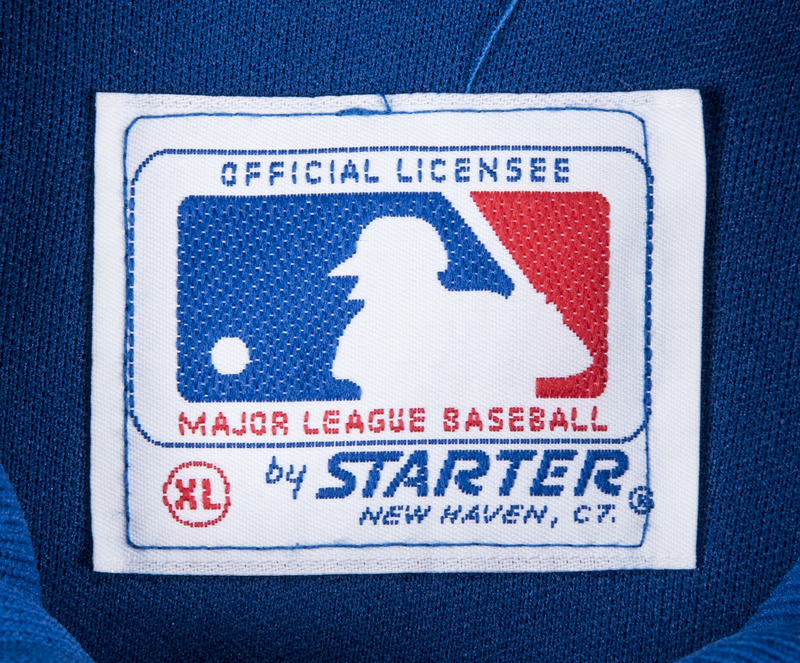 A Starter size “L” tag is sewn on the back inside collar. 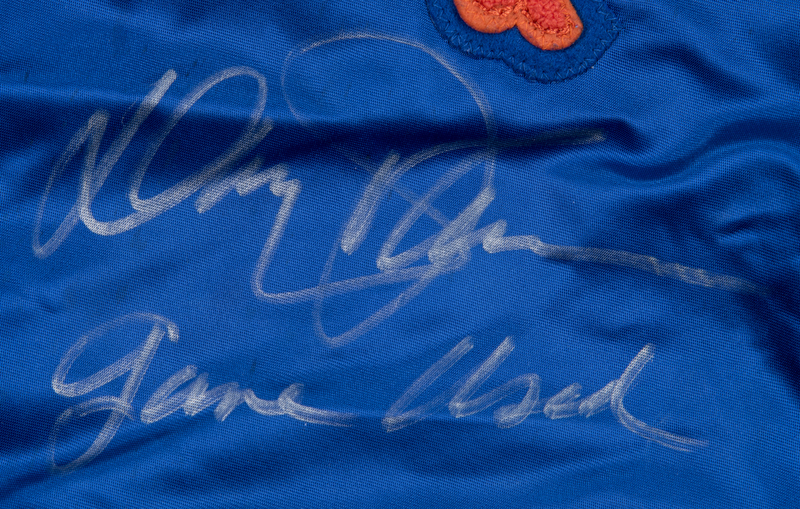 Johnson has signed the chest of this jersey in silver marker and inscribed “Game Used”. 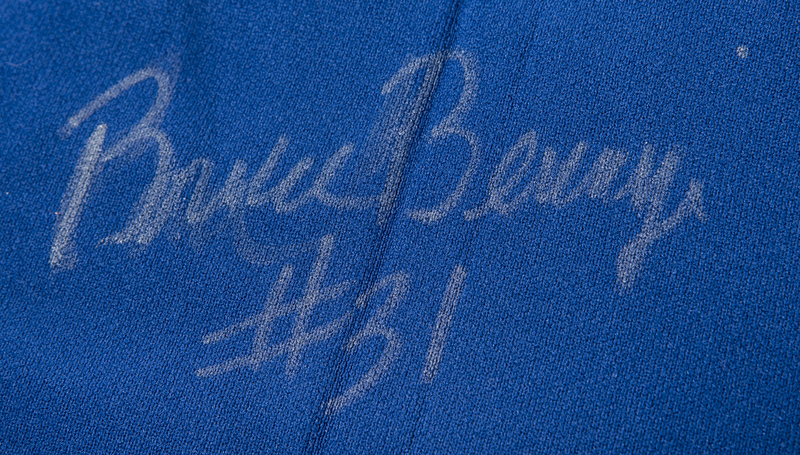 This item comes with a COA from Beckett (F63979). 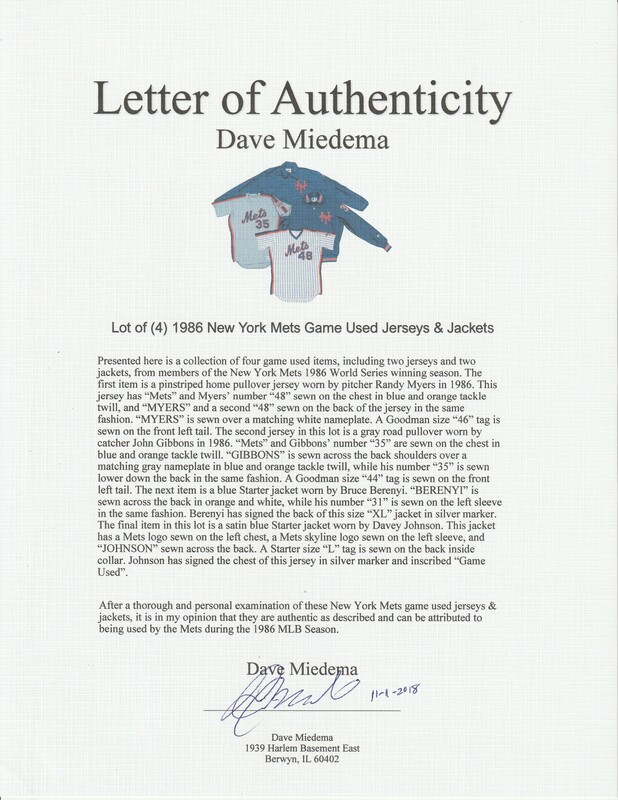 This lot comes with a LOA from noted game used expert Dave Miedema.